Salam & helooooo everyone! Lipstick time! Aaa.. I need to cut my obsession to lip balms and lets get more "womenly" to lipstick. I don't have that many of lipstick. So I grabbed these lipstick from a contest I won recently from L'Oreal. i got to pick any L'Oreal stuff I won. So I decided to review this since I have been using it for quite sometime and I hope you find it helpful to search for a nice lipstick! Will blog about the prize haul pretty soon and stay tune on how you can win one of theses awesome lipstick I included in a mini giveaway I plan for my lovely readers! So now let get back to the review baybeh. What my thoughts are? This is not a newly launch lipstick or new collection from L'Oreal. It has been in the retail store for quite a long time. Consist of 14 shades to choose from many finishes but all of them are opaque finishes and not that sheer type of lipstick which I love! Packaging wise, I kinda hate how the tube is designed slanted a bit on the base makes difficult for me to stand it and store it. I store it in my lipstick holder and make the name labels facing upwards, so the slanted base kinda makes it hard to stand. I know its just a packaging, but I do care on how I wanna store it because it makes a point on how you take care of your makeup right. What if it falls and break. Fly bye bye to ya money some more. Aaa... Don't want Don't want.. If you love a lipstick that does not have any scent to it, well this is for you girl. This lipstick does not have any scent to it. It also does not taste weird. The texture of this lipstick is very~very creamy, glides on smoothly and the color is build-able. All of the colors are gorgeous! But since its very creamy, I think a help of a lip liner is a must to keep it sharp and neat. This does move around without it. Some brighter color like the Viva Read and my favorite Touch Of Amaranth leave quite tint to your lip. You need a good lip makeup remover for this. In terms of hydrating, this lipstick is hydrating enough without needing of a lip balm. It is very moisturizing. Now let's talk about each colors, because my pictures aren't that accurate especially the picture above when I am wearing each lipstick color. Viva Red, A semi dark red lip color with no sparkle. Its not matte but a nice satin finish. I think suits both warm, cool and neutral undertone skin. Touch Of Amaranth, A very very bright pink fuchsia lipstick with no hint of sparkle just creamy opaque satin finish. I freaking love this color but still shy to use it during day time because its super bright! Rosy Tea, A neutral pink undertone color. Satin finish with a lil hint of sparkle and glitter. In my lip swatch picture, this looks like My First Pink, but this one id more of a lighter shade of pink. Think Pink, a warm pink undertone with no hint of sparkle of glitter at all. Satin finish. My First Pink, looks similar to Rosy Tea but this one is much more darker with a lil hint of purple undertone, Satin Finish. Peach Dream, a peach-orangy tone lipstick color with a hint of gold glitter. Not a chunky one, but a fine glitter. Have you tried one of these? Which is your favorite color? Im an avid fan of opaque lippie,never like sheer lipstick.hehe.btw,Love touch of amaranth n viva red on u.so vibrant! they are really nice! you should check these lippies! yep! true to that, i am still shy to use the first 2 colors during day, but they so niceee! I bet you gonna love Viva Red and Touch Of Amaranth! hehe.. pengaruh sabby la ni now i am obsessed towards lipsticks! i am obsessed with red lipsticks so obviously am biased hehe..the viva red looks delicious on you! thanks! well if you love red lippies, you really should check out Viva Red! Thank You!!! Sab mmg suka Touch Of Amaranth tu! cantikk! Meletopssss kau pakai merah tu. Cantik! ade yg colour more to orange x?n kalau mkn or minum sng hilang x? I'm obsessed with lipsticks and all of my friends know that already. haha. These looked yummy! I love bold lip colours! So much that I even wear them to weddings and girls day out. haha. In this collection, I think I'm choose Rose Tea just because it is a natural one. From my past experience, I prefer my natural colours to have a bit of gloss finish and the bold one a little less glossy. i know you do! yep, rose tea is super nice, and i have tried another new one from this called dewy beige. pretty nice too! 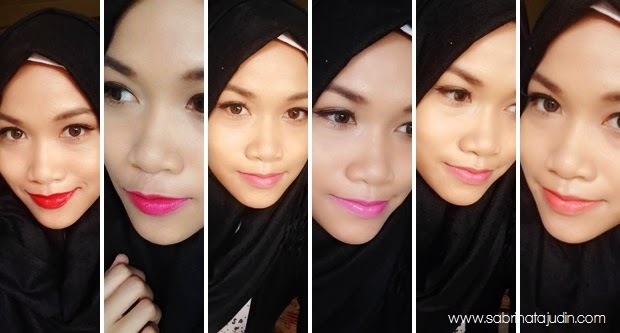 byknya lipstik Loreal, tak nak cuba brand yang lain?